Writer and historian Wallace Stegner called America’s national parks, “the best idea we ever had.” I’d have to agree and most travellers are familiar with names like Yellowstone, Yosemite or the Grand Canyon. America’s national parks are magnificent, all fifty-nine of them, but some of the wildest areas in America are outside of its national parks. Most people, even most Americans, don’t realize that 20% of the entire landmass of the United States is preserved as open, federal public land OUTSIDE of the national park system (over 440 million acres, or 18 million hectares to be exact). Most of these lands are concentrated in the western United States and managed by two government agencies; the U.S. Forest Service and the Bureau of Land Management (BLM). Some of the most beautiful places in North America are in the national forests, monuments and recreation areas managed by these two agencies. In the Pacific Northwest states of Oregon, Washington and Idaho there are four national parks, but there’s over 100-million acres of public land outside of them in national forests, national monuments and national recreation areas. Within these lands are wild & scenic rivers, alpine lakes, vast wilderness areas, endless forests, glacier covered mountain ranges, canyons and deserts. National Forest and BLM lands are less restrictive than national parks and you can camp, hike, fish, hunt, ski, boat, climb – just about anything you’d want to do outdoors. These areas are far less crowded and cost less to visit than national parks. In these lands you can hike through the wilderness for weeks and in most cases, for free. In fact, most national parks in the Pacific Northwest are surrounded by them. Accommodations within these lands range from luxury lodges through rustic drive-to campsites to remote campsites far out in the wilderness. You can get maps, guidance and all sorts of useful information on these lands from the U.S. Forest Service and Bureau of Land Management websites. But, there is a down side to all of this. How do you get to them and around within them? Here in the Pacific Northwest there are some national forests and wilderness areas close to major cities, but most are not. And while most major national parks have free or inexpensive shuttle services within them, national forests and monuments don’t. RENTING A CAR: This is the most obvious and convenient way to go, but can be somewhat expensive. A group of travellers can reduce costs by sharing expenses, but solo travellers can’t. Also, if you are trekking into the outback for days at a time, paying rent on a car that is just sitting in the parking lot may not be desirable. On the other hand, if you aren’t packing into the wilderness, the cost of renting a car can be offset by camping out of it with some basic camping gear in any of the hundreds of rustic campgrounds around the Pacific Northwest’s national forests and recreation areas. If not a camper most national forests, monuments and recreation areas have a selection of budget to mid-range motels in nearby towns. If you can afford it, renting a vehicle is the best way to go to reach America’s more remote areas. It’s difficult to recommend a particular car rental company since many offer specials throughout the year and one may be less expensive than another at any given time. In general, a foreign visitor renting a compact car for two weeks can expect to pay about $800 plus gasoline (roughly $70/day including gasoline). Most major car rental agencies have some things in common; a) Your foreign driver’s license is fine for driving a car in the United States, b) foreign visitors may be charged extra costs for liability insurance, c) drivers under the age of twenty-five will likely be charged extra cost for insurance, d) most rental agencies have some restrictions on driving on unpaved roadways. The most economical and practical vehicle to rent is a compact or mid-sized sedan. There are few areas where a visitor to the Pacific Northwest will need four-wheel drive or a recreational vehicle. Camper vans, or recreational vehicles, offer the comfort of on-board kitchen, bathrooms and sleeping quarters, but these conveniences may be offset by the high costs of renting and operating the vehicle and difficulty of driving it in cities. Regardless of what type of vehicle you rent, be sure ALL costs are included in the quote before you reserve it. Are all insurance costs and taxes included? Are there any drop-off fees or non-refundable cleaning charges? Are there extra charges for young drivers or foreign visitors? These can add up. Guide: With a vehicle you can base yourself out of towns that are surrounded by some of the most magnificent and remote areas in the Pacific Northwest. Joseph Oregon and adjacent Wallowa Lake in northeastern Oregon for example. Joseph and Wallowa Lake are in easy reach of the Eagle Cap Wilderness and spectacular Hell’s Canyon. These are areas so large you could spend the whole summer exploring them. There’s a selection of B&Bs, cabins and lodges or camping in the State of Oregon campground on the shores of Wallowa Lake. Grangeville Idaho is another place you could base out of with its proximity to some of the largest wilderness areas, deepest canyons, and wildest rivers in the U.S. outside of Alaska. Grangeville has a selection of budget to mid-range hotels and private camp areas making it an easy place from which to explore some of the best of the wild west. ORGANIZED TRIPS: Many independent travellers groan at this idea, but there are some good trips available and it can be fun to travel with a group of like-minded people. Although expensive, they often go into areas that would be very difficult to access without them. Guide: For the budget-minded there’s Green Tortoise which specializes in affordable camping bus tours from San Francisco or Los Angeles to national parks, monuments and other areas. These trips don’t stray far from the beaten path, but they do get into some nice areas. For example, Green Tortoise offers a seven day bus tour, starting and ending in San Francisco and traveling through national monuments and parks in northern California and Oregon for $640, food and activity costs included with trip members sharing cooking and cleanup chores. Green Tortoise also operates a chain of hostels in major cities across the U.S. and their website provides details for all of this. For those willing to spend more and go deeper into the wild, there are outdoors clubs that offer guided hiking, camping, skiing, and climbing tours to remote areas. the Sierra Club and Recreational Equipment Incorporated (REI) offer trips that will get you deep into national forests and monuments throughout the U.S. with a week-long backpack trip costing between $1,000 to $1,500. Their trips range from easy to strenuous, for people of all ages, and for novices through the experienced. You are responsible for your own food and camping gear and you must find your own way to the meet-up point for the trip. However, many trips originate in cities and you can often arrange local transportation with other trip members. You don’t need to be a member of REI to participate in their Adventure Trips, but you do need to join the Sierra Club ($25) to participate in their National & International Outings. Check the Sierra Club and REI websites for trips and details http://contact.sierraclub.org/outings/national and http://www.rei.com/adventures. For the adventure junkies, and at the top of the cost range, are private outfitters and guide services. Outfitters usually focus on an adventure activity such as whitewater rafting, sea kayaking , mountain climbing or horseback treks deep into the wilderness. While some of these trips target specialized clients, most are open to people of all ages, first-timers through experienced, and anyone in normal physical condition. You bring your change of clothes, personal toiletries and cold weather or rain gear while the outfitters provide everything else including food and camping gear. They’re spendy, but we have our favorites. For example, a six-day whitewater raft trip down Idaho’s fabled Salmon River will cost $1,600 – $2,000 per person, food and gear included. You have to find your own way to the meet-up point, usually a small town or river landing near the beginning of the trip, but most outfitters can help with transportation to remote meet-up locations or connect you with local transportation services or other trip members that can get you there. SELF-GUIDED; USING PUBLIC TRANSPORT: If for whatever reason you don’t have a car, you can still reach some spectacularly wild and remote areas in the Pacific Northwest by using a combination of public and private transport. While relatively inexpensive, this will be time consuming and takes some planning. If you are planning on extended trips into the wilderness you will need to bring your camping equipment and pack. 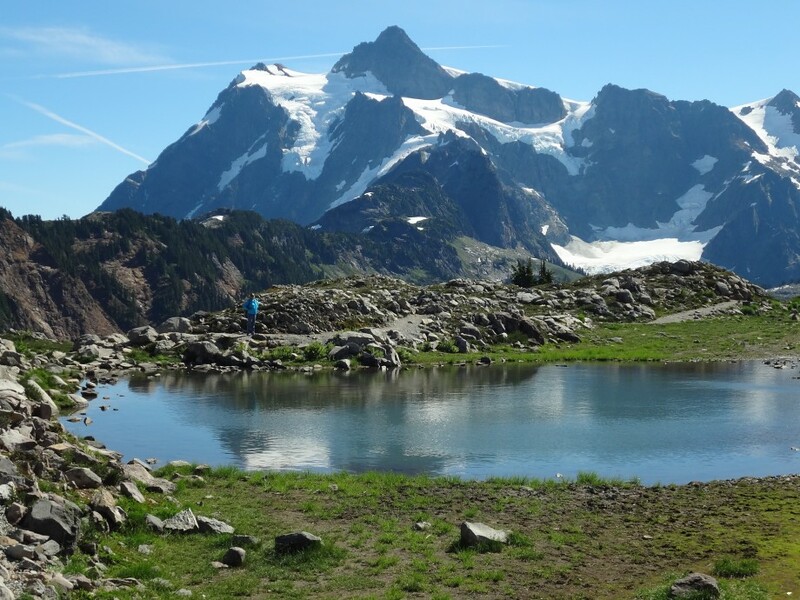 In the Pacific Northwest there are a some towns located right inside of major national forests, monuments and recreation areas from which you can walk directly into the adjacent wilderness or use readily available local transportation to reach trails, lakes and mountains. These towns have a selection of motels and camping areas in town. Chelan, Washington located on fifty-mile long Lake Chelan, and its remote neighbor Stehekin, are such places. Chelan is located on the eastern end of Lake Chelan and is a jump-off point into the vast wilderness areas in the North Cascades Recreation Area and Park as well as endless trails into the Okanogan and Wenatchee National Forests. Tiny Stehekin is at the western tip of the lake and is actually inside of the Chelan National Recreation Area with hundreds of miles of trails into pristine forests, alpine lakes, and glaciated mountains. The Lady of the Lake ferry provides service between Chelan and Stehekin. There are campgrounds in each town ranging from the free Purple Point Campground in Stehekin to the Lakeshore RV Park in Chelan with tent camping sites at $35/night. Both Stehekin and Chelan have a selection of motels, B&Bs, cabins and lodges starting at $125/night. So, you can base your explorations into the wild right from town, or you can backpack for days or weeks on end, and for free, into the surrounding wilderness areas. Other towns are located near, but not in, major forests, wilderness areas or national monuments but have private shuttle service or taxis that can take you to trailheads, lakes or recreational areas. Leavenworth, Washington, surrounded by the Wenatchee National Forest, for example. Touristy Leavenworth is surrounded by the vast wilderness areas of the Wenatchee National Forest and famous among hikers for its proximity to the remarkable Enchantments Wilderness Area, a high, rocky basin of crystalline alpine lakes and glacier-scoured rock. Leavenworth itself isn’t geared towards the budget traveller, through there is a selection of mid-range hotels in town between $90 – $150/night and a few private campgrounds with cabins, or tent sites starting at $35/night. Restaurants in town are expensive with a couple of fast-food options available. A traveller on a tight budget would do best by going directly into the outback or to nearby Forest Service campgrounds. To do that, there is Leavenworth Shuttle & Taxi Service that will transport backpackers to trailheads into the Alpine Lakes Wilderness Area or nearby campsites in the national forest for about $50. Getting to Chelan/Stehekin: To reach Chelan from Seattle you can take the Wenatchee Valley Shuttle Service directly from SEATAC Airport to Wenatchee for $45 one-way (weekdays only – reservations required). Or you can go to Wenatchee on the Northwestern Trailways bus from the Greyhound bus terminal in downtown Seattle (weekdays, one-way for $36) and then take the local LINK Transit system bus to Chelan, one-way, for $2.50. If you need to stay in Wenatchee for the night, there are budget through mid-range and budget hotels starting at $55/night and a surprisingly good selection of pubs and restaurants downtown. Once in Chelan the Lady of the Lake ferry gets you Stehekin for $24 or can drop you off and pick you up at trailheads and campsites along the lake. Getting to Leavenworth: You can reach Leavenworth on the Northwestern Trailways bus from downtown Seattle for $36 one-way or on the AMTRAK bus leaving from King Street Station near the sports stadiums in downtown Seattle also for $36. Once in Leavenworth the Leavenworth Shuttle & Taxi Service can get you around locally to trailheads and campgrounds. We certainly don’t discourage anyone from visiting America’s magnificent national parks, in fact we recommend that you do. But for those wanting to get further off the beaten path, to escape the crowds, to experience the wilder side of America, there are spectacular places to go and practical ways to get there. If you have questions about anything in this article, please contact us.